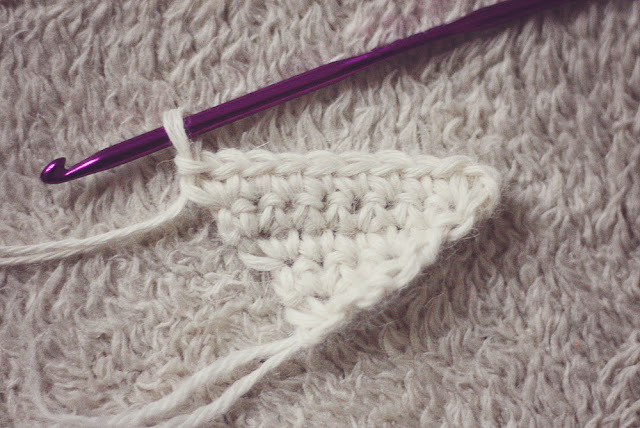 I know I am a little bit too late with this tutorial, Christmas is just around the corner, but it is better now than never. Actually this kind of decoration can be used for many occasions - Valentine's day for example, or a birthday party! 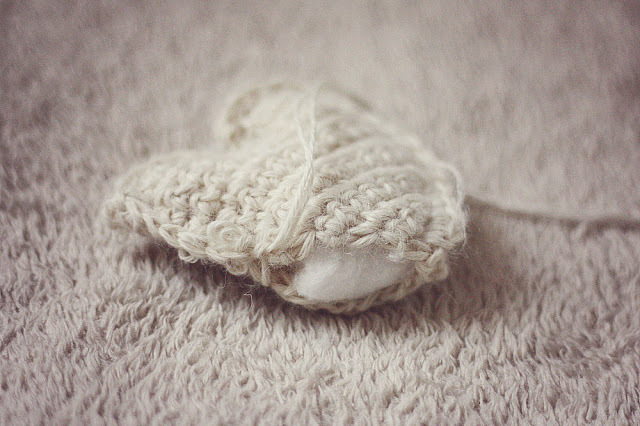 * yarn (the best is to use 100% wool (or it should contain at least 80% wool otherwise it will not felt). The weight of yarn depends on you, just keep in mind thinner yarn you use smaller hearts you get. I used DK weight yarn. Repeat Row 11 two times more and fasten off. 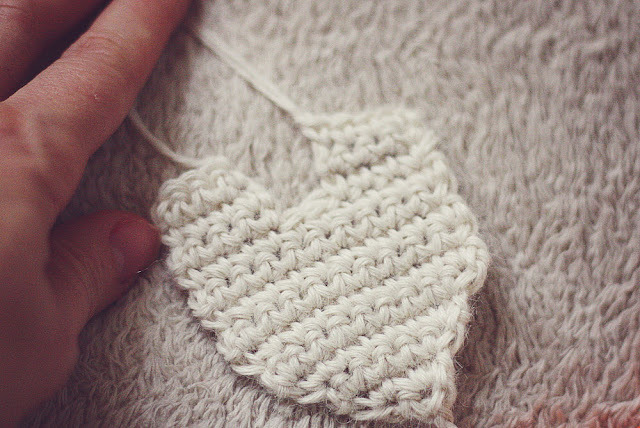 Repeat Row 11 two times more to shape the second half of the heart. Fasten off. 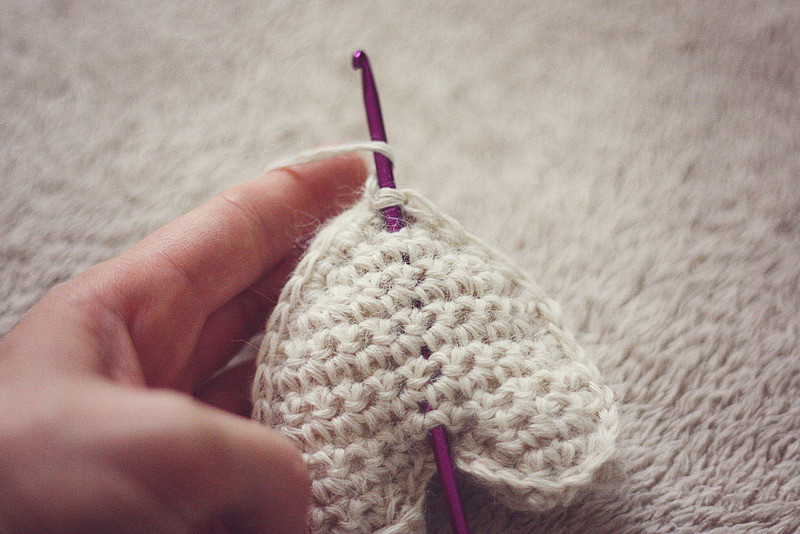 Put both hearts together and work evenly sc around them (doesn’t matter where you start). 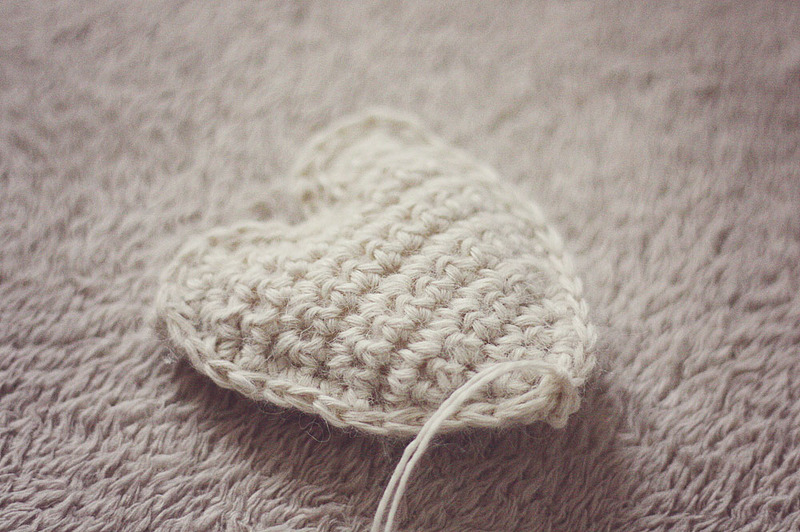 While you work sc around the hearts try to hide all tails between the stitches. 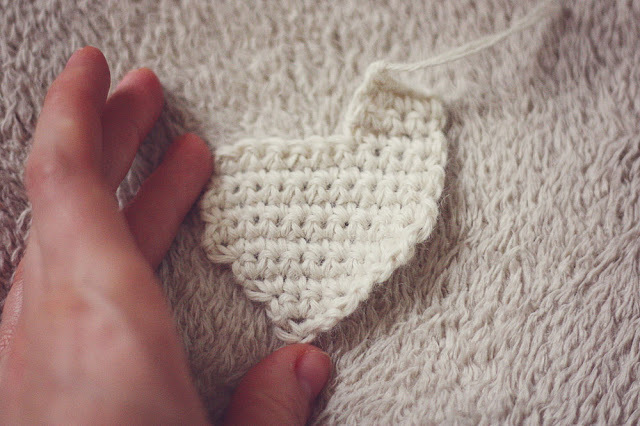 Leave 1 inch long space (don’t cut the year, you will have to close it later), and using this space fill the heart with cotton. When it is done, work sc till the end to close the space and fasten off. Now hide the tail inside the heart, insert the hook as shown in next photo, yarn over and pull it inside. 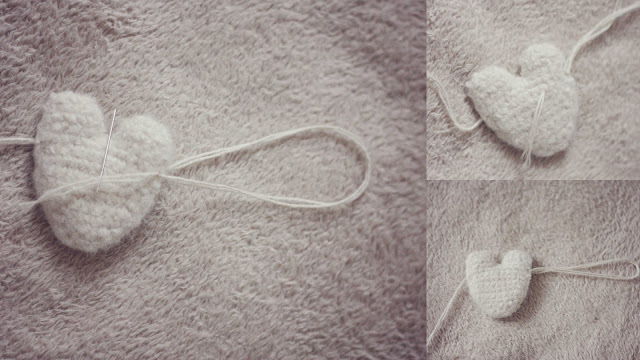 I would suggest you to make as many hearts as you need and then continue with felting. I made six hearts. One way to felt is to machine wash in hot water, adding towels to the wash for added friction. 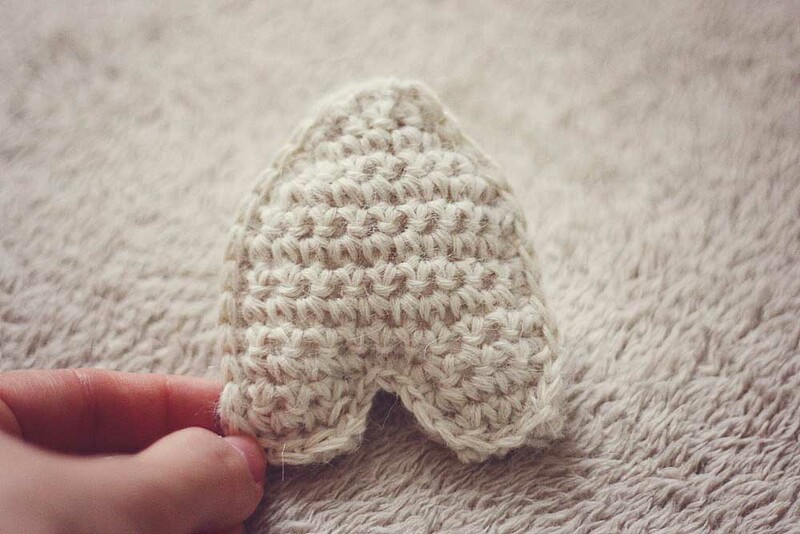 I don't suggest to do it with these hearts as in this case the result will be unpredictable and you don't know which shape your hearts will have when you get them out of machine. 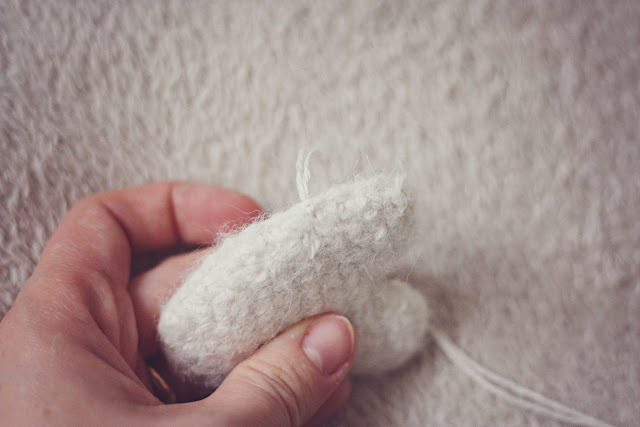 That’s why I suggest hand felting. Prepare a bowl of hot, soapy water – washing up liquid is perfect! Leave all hearts to soak in the water for a few minutes. Take one heart at a time, hold it between your hands and rub hard to create friction. Dip it in the water time after time and continue rubbing. If you get tired leave it in the water and take a break. 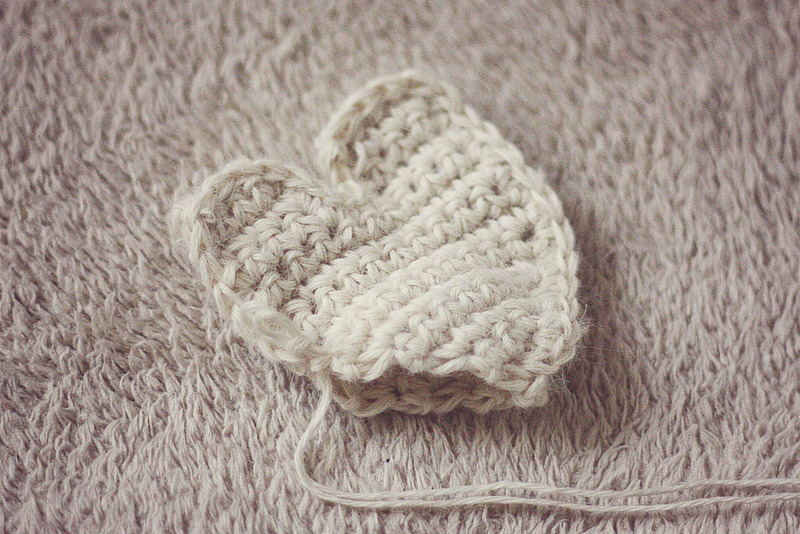 Then continue rubbing until the heart gets thick and stitches disappear. You can make as many breaks as you need, just add hot water and some more washing up liquid every time. Do it with all hearts. You will see at the end you will need just a few minutes for each one. When you are happy with the result, rinse the hearts in the clean water. Let them dry. I cut 5 stars from scrapbooking paper. I suggest to paint the star on the wrong side of the paper and then cut it out. 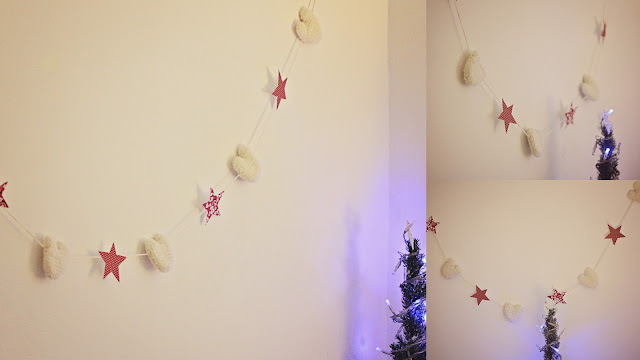 Now cut the strand of yarn as long as your garland should be + 20cm or 8inches to make the loops at both ends to hang your garland. 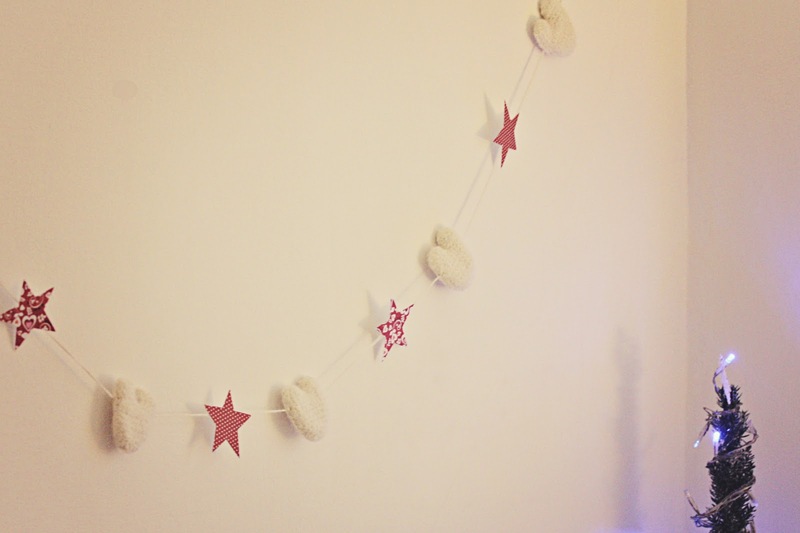 I decided to make my garland 1.5m long, so I cut 1.70m long strand. Thread the needle with the strand you just cut. 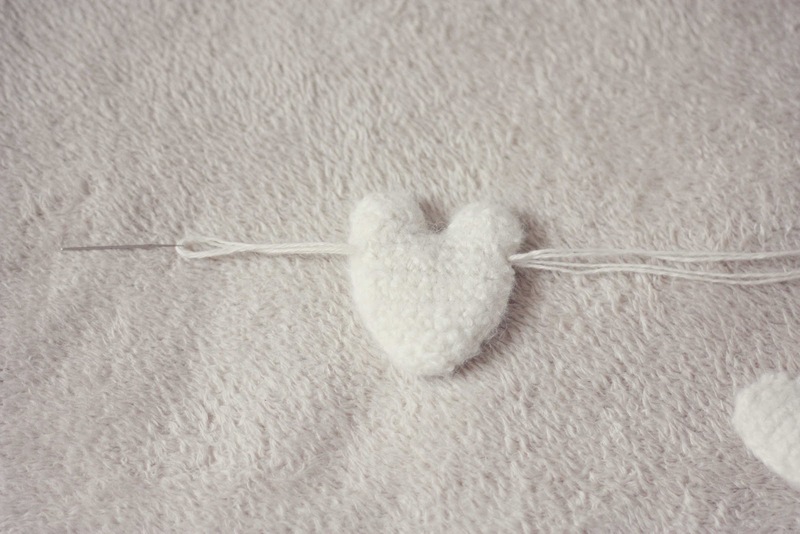 Take a heart and draw the strand through the heart as shown in the picture below. Leave 10cm long tail (to shape a loop later), and work a stitch on your heart to fix it where it is and to prevent it from moving. Make it twice. 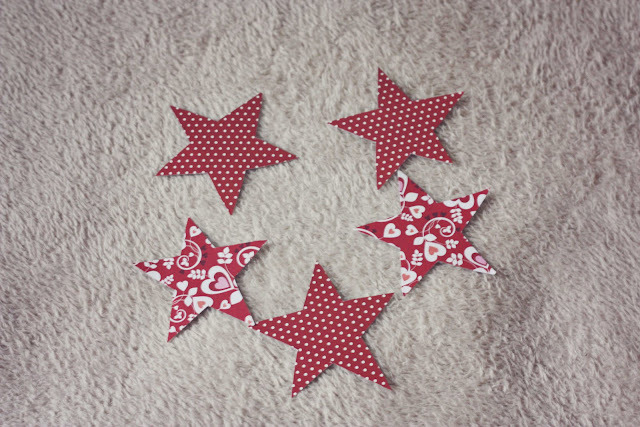 Do it with all hearts leaving between them equal spaces (think that in the middle of each space you will have to attach the star, or whatever you want). Also on another end leave 10cm long strand to shape a loop. 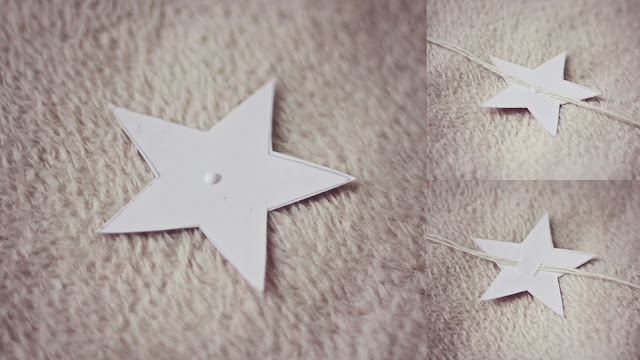 Take a star, in the center put glue (very little) and put on it the strand (take care about distances between the hearts, they should be equal) and cover it with small piece of paper. Actually later I realized that it would have been better to cover it with exactly the same kind of star, so you would have a beautiful star from both sides, but I left it as it was as I was going to hang it on the wall anyway. Repeat it with all stars. 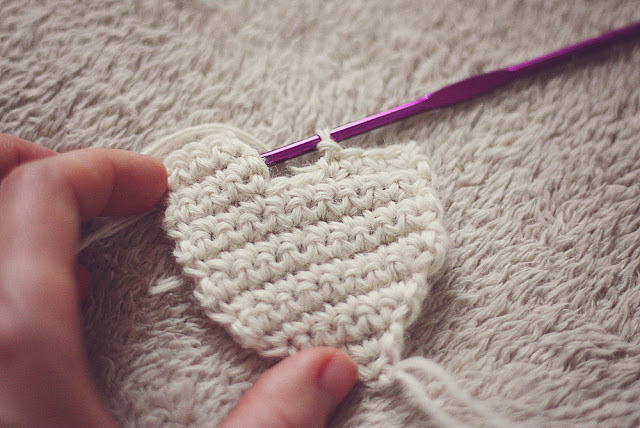 Now the last thing you should do is it to shape the loops on both ends of your garland. 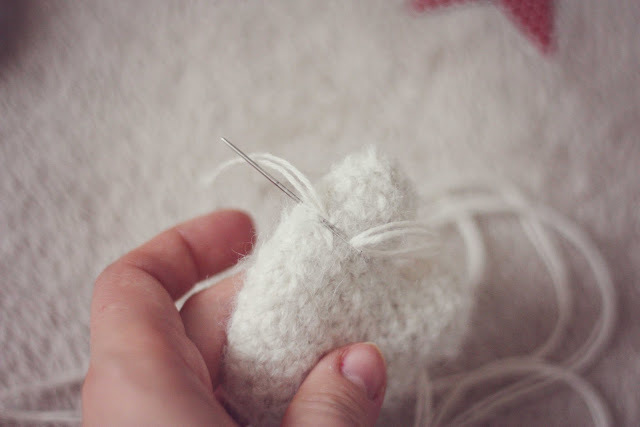 Thread the needle with one end, draw it through the heart (at the same point where the end was coming out), shape the loop, and work twice a stitch at the same point to fix it. Then draw remaining tail through your heart and cut it. I hope this makes sense and here are the photos how I did it. Make the same with second end.